A screen shot of the DC OCF order. The DC Office of Campaign Finance recently issued an order regarding a complaint against Ward 4 Councilmember Brandon Todd for allegedly using Council office resources on behalf of a political campaign. Todd was a vocal supporter of Kathy Henderson during the 2018 election for Ward 4 State Board of Education. Some residents who received emails from Todd promoting Ms. Henderson complained to the Office of Campaign Finance (OCF). On March 18th, OCF issued an order that fined Todd $4,000 for the incident, due to violations of DC Official Code § 1–1163.36(a) and 3 DCMR 3301, using government resources for campaign-related purposes. One of the emails residents received during the 2018 SBOE campaign. That’s the crux of the issue — some people allege the only time they contacted the Councilmember was for official business, and not personally or during a campaign, therefore the only way he could have gotten their email address was to pull it from correspondence sent to his DC Council office. Todd has repeatedly said he only used email addresses he’s collected over the years from personal use and not from official business. He provided access to his MailChimp receipts and lists to OCF. However, after their investigation, OCF stated there was enough circumstantial evidence to support the claim of residents and to give the appearance of impropriety. Todd can have the fine cut in half if he attends Ethics Training at the Board of Ethics and Government Accountability in the next two months. During the campaign for Ward 4 Member of the State Board of Education, Ward 4 Councilmember Brandon Todd threw his public support and endorsement behind Rhonda Henderson for the open seat. 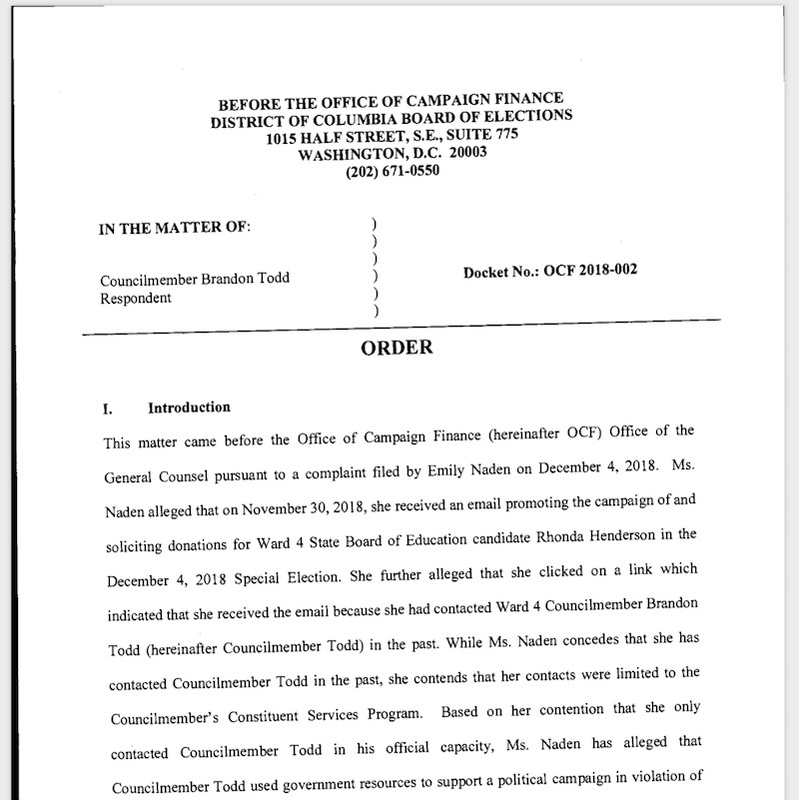 The question and concern, alleges Zach Teutsch, an outgoing commissioner with Advisory Neighborhood Commission 4C, is if Todd used his official DC Council resources resources to help Ms. Henderson try to get elected. Updated with a statement from CM Todd.